There’s an admirable quiet intensity to A Moment in the Reeds, a first feature by London-based Mikko Makela set in his native Finland. Superficially similar to God’s Own Country, this bittersweet tale of attraction between a prodigal son and a refugee worker is both a more straightforward romance for much of its runtime and a sadder one in the end. Thin, blond Leevi (Janne Puustinen) has reluctantly returned home to help father [Jouko] (Mika Melender) fix up the family summer cottage before it’s put on the market. […] [Jouko] can find scant common ground with a gay son who’s run off to Paris to study literature. […] Leevi isn’t the handy type, so his father has grudgingly hired a laborer through an agency to help with the renovation. […] [T]hat turns out to be Tareq (Boodi Kabbani), a handsome, hirsute Syrian refugee […]. A Moment in the Reeds is deliberately spare in all departments, heightening impact through restraint. Thus there’s no musical scoring at all until past the two-thirds mark; Iikka Salminen’s cinematography is plain at first, waxing more lyrical as emotions grow warmer. Other contributions likewise turn budgetary limitations into a virtue. The small cast is expert, suggesting a lot of rehearsal time was put into deepening characterizations. 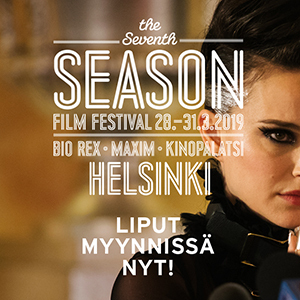 Director Mikko Mäkelä and the actors will be present at the screening on 25 September at Kinopalatsi 5 at 20.45.